Sample tweet: "Not required to file a tax return? Here are 6 ways it may pay to file anyway. 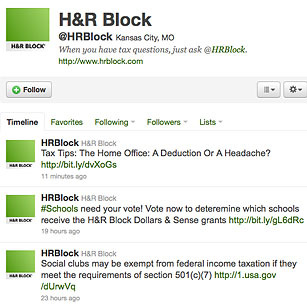 http://bit.ly/gmcsad #taxes"
Though it's yet to develop the massive following of some of its corporate brethren, @HRBlock makes up for that by offering tax tips and help on demand. When the tax man cometh, that makes this one valuable feed indeed.